The Bahrain Center for Human Rights (BCHR) expresses great concern for the health and well-being of detained human rights defender Nabeel Rajab, the president of BCHR. 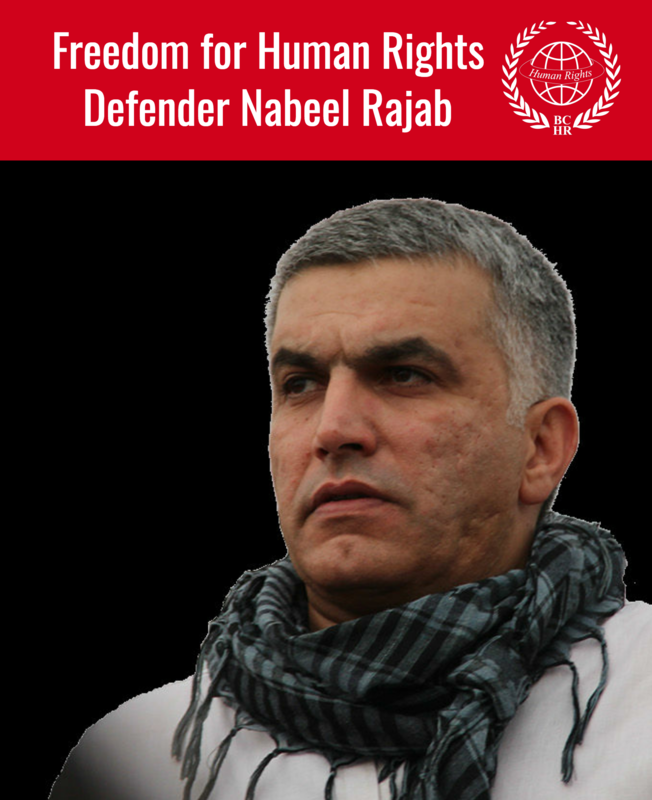 Rajab is also Founding Director of the Gulf Centre for Human Rights (GCHR) and Deputy Secretary General of FIDH. On 28 Jun 2016, Rajab was transferred to the Bahrain Defense Hospital’s Coronary Care Unit after he suffered irregular heartbeats. His family was also informed that he has high blood pressure, a condition for which he was treated with medication over two years previously. The extremely poor conditions of prison have caused the further deterioration of his health. The decline of his physical and mental health are due to his isolated detention since his arrest on 13 June 2016. Rajab is enduring extremely poor conditions in this pre-trial detention. He is being detained in solitary confinement, with no contact nor any interaction at all with other prisoners. The living conditions in his cell are extremely unsanitary, as the toilet and shower are unclean and unhygienic. There is either no or very little water in the bathroom. Furthermore, Rajab suffers from illnesses that are only worsened due to his detention conditions. His blood tests have shown that he suffers from a urinary tract infection and low mononucleosis, and he is awaiting the results of additional blood tests. Rajab also needs to have surgical operations to treat gallstones and an enlarged gallbladder. He also suffers from an enlarged prostate and needs to be seen by a hematologist. His surgeries will be scheduled in August. On 26 June 2016, the authorities notified Rajab that his first court hearing in another case is set for 12 July 2016. This is a separate case over two charges related to tweets and retweets posted on twitter in 2015 about Jaw prison and the war in Yemen. He may face up to 13 years in prison if convicted in that case. Rajab is expected to appear before the public prosecution again on 29 June 2016 for a decision on his detention. Although he has been detained pending investigation for over two weeks now, it has been noted that he wasn’t further interrogated. BCHR believes the harassment against Rajab is in violation of Bahrain’s commitment for the protection of human rights defenders as per the United Nations Declaration on the Right and Responsibility of Individuals, Groups and Organs of Society to Promote and Protect Universally Recognized Human Rights and Fundamental Freedoms, adopted by consensus by the UN General Assembly on 9 December 1998. According to this Declaration, human rights defenders are entitled to seek protection and realization of their human rights at the national and international level. Moreover, human rights defenders have the right to and need to be protected against any form of reprisals, when submitting critical assessments and proposals for improvement towards mechanisms that prevent the realization of human rights, aimed at governmental bodies, agencies and organizations concerned with public affairs. BCHR call on the government of Bahrain to abide by its obligations to respect and protect human rights defenders, and to immediately and unconditionally release Rajab. 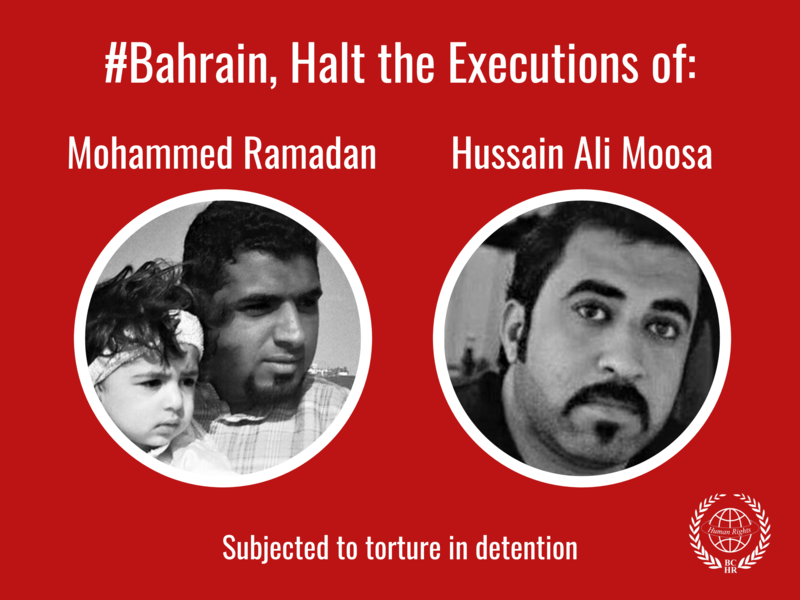 BCHR also calls on the international community and Bahrain’s allies to take urgent and public actions to stand for their commitment to protect human rights defenders and to publicly call for the immediate and unconditional release of Rajab, and for an end to the government of Bahrain’s reprisals against human rights defenders.